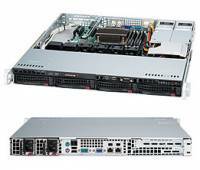 The Supermicro SC813M 1U Chassis is a density-optimized mid-level server chassis, ideal for storage appliances, HPC, and datacenters. With a depth of only 19.85", its compact design houses ATX motherboards of up to 12" x 10" and supports one Full-height, Half-length PCI addon card. A selection of optional LCD front bezels are also available for customers who require customization. Bulk package and quick release slide rails also available for HPC and datacenter use. 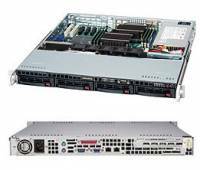 The Supermicro SC813T 1U Chassis is optimized for general purpose and effective server applications. With a depth of 25.6", this chassis can house 12" x 13" extended ATX motherboards and support a maximum of 2 add-on cards (1x Full-height/Full-length and 1x Low-Profile) in selected models. Optional LCD front bezels are also available for customization requirements. Bulk package and quick release slide rails also available for HPC and data center use.